Life in Teacup: Concept Tea (7) - Camellia sinensis Tea? Concept Tea (7) - Camellia sinensis Tea? What is tea? There are different definitions, some broader, some more peculiar. This is a joke for people who think tea should only be from Camellia sinensis, a species from Theaceae Family (Tea Family) and Camellia genus. This cup of drink, whether you call it tea or not, is from Camellia sinensis. The sweet little flowers are tea flowers! I've seen producers of different tea varieties selling tea flowers, by-products of their tea trees. This one is a little more creative. The tea is green tea made with oolong cultivar, processed into curled shape, and the flowers are from the tea trees. I thought it was an interesting thing and was curious how it tastes. The taste is not typical for a tea. It's not something that would blow you away, but quite novel to try. The flower flavor is subtle but easily detectable. It's a mix of pollen flavor and very light honey flavor. In southwestern China, especially Sichuan, there is a type of "tea" people drink in summer. It's not from a plant in Theaceae family. It looks somewhat like tea. It tastes quite different from most teas, but there is probably a tiny bit of similarity in flavor. 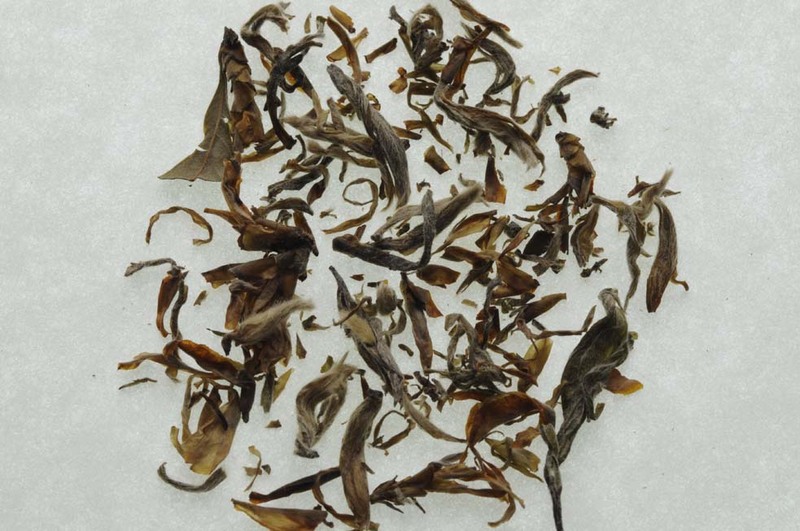 These leaves contain a lot of tea polyphenols that are almost identical to those poly phenol molecules found in tea leaves. And then there is the famous Ya Bao ("leaf bud") that was sold by a lot of Chinese puerh vendors a few years ago. Many of them are claimed to be leaf bud of wild tea trees. It turned out many, or most, of these "wild tea trees" are not Camellia sinensis, not the same trees people harvest tea leaves from. Rishi tea sells pure tea flowers! I've been curious to try tea flowers. I'm also really curious about "tea" from other plants in the Theaceae family...I'd be interested to learn more about this if you have any more info. I wrote a while back about other camellias for tea but I haven't looked at plants in the same family but in a different genus yet.